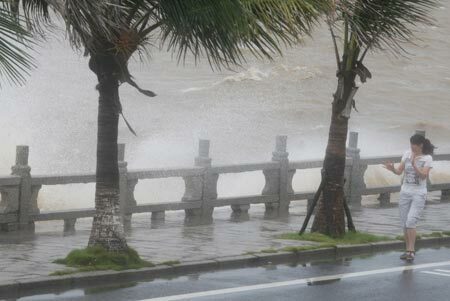 Large waves and strong winds announce the typhoon’s arrival in Zhuhai, Guangdong Province on Thursday. Typhoon Chanthu, the third of the season, hit the coastal city of Wuchuan in southern China’s Guangdong Province on Thursday afternoon, leaving two people dead and dozens of fishing boats missing.More than 1.35 million residents have been affected by the storm in western Guangdong, the provincial flood-control headquarters said late on Thursday. The China Meteorological Administration had predicted "ferocious precipitation" in Guangdong, the island province of Hainan and the Guangxi Zhuang autonomous region. Thousands of banana trees were toppled. Meteorologists in Guangdong forecast that Chanthu would continue in a northwest direction at a speed of 15-20 km per hour, moving over neighboring Guangxi on Thursday night while weakening gradually.